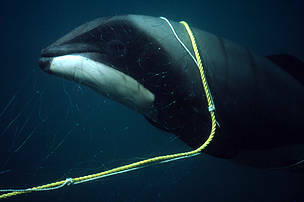 Entanglement in fishing gear is the leading threat for whales and dolphins around the globe – estimated to cause at least 300,000 deaths per year. In many countries there is a lack of political will to address the problem or it is not a political priority. Inaction is usually due either to lack of awareness of the scale of the problem (bycatch is often unseen and unknown to anyone other than the fishers), lack of understanding of the tools that can be used to mitigate bycatch, a perception that mitigation will impose high costs, and a lack of adequate regulation and/or enforcement. 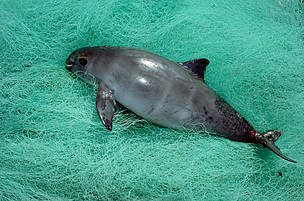 WWF has worked with the IUCN and CMS to publish a technical report on reduction of cetacean bycatch and entanglements. WWF is working closely with NOAA to help countries who export fisheries products to the US comply with the new MMPA import regulations which require countries to show that they are working to reduce marine mammal bycatch in that fishery. Download a key report here . WWF Peru is working with partner NGOs and fishers to test pingers on artisanal gillnets, as well as onboard cameras and electronic log books with industrial anchoveta fishing crew to improve monitoring of bycatch in this fishery and identify best mitigation measures. WWF Pakistan has implemented a crew-based observer programme, where fishing vessel captains are trained to collect data on bycatch, release whales and dolphins safely when they can, and collaborate with researchers to test new ways of deploying their gear to reduce dolphin bycatch. What more can WWF do under the new deal for whales and dolphins? 1. Collaboration: Sharing lessons through partnerships and outreach. This problem cannot be solved by one organization, or one government, alone. 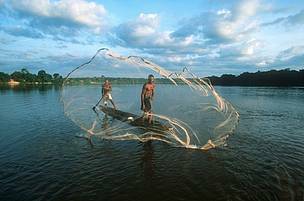 WWF is uniquely placed because of our global network and global reach. We work with local communities, governments, the private sector, and international organisations to find pragmatic solutions to support our conservation goals. WWF offices around the world have valuable experience and lessons to share with others, and WWF can also disseminate best practices and innovations from around the world through our global network and partnerships. 2. Providing evidence and tools for bycatch monitoring and reduction: Scientists and fishers around the world are trialing both high- and low-tech methods to more effectively monitor and reduce bycatch. But these innovations are often fragmented and need to be available and implemented through a more holistic approach, at a global scale. Governments and fisheries need better access to guidelines and tools to help them choose the strategies to document, regulate and reduce bycatch most appropriate to their circumstances. WWF is in a unique position to partner with other organisations to collate information on best practices and to generate case studies, model regulations and mitigation tools easily accessible through user-friendly online portals and databases. 3. Advocacy and influence: Integrating bycatch reduction into governance - from local to global. Best practices must be widely shared and their implementation encouraged and supported. As a global NGO with a proven track record of effective advocacy and public engagement, WWF can play a leading role in raising awareness of the risk that bycatch poses and the solutions that governments and fisheries bodies can use to reduce or eliminate this threat.